Healthy individuals received 2 injections of nerve growth factor or isotonic saline in the left or right masseter and temporalis muscles. Repeated injections of nerve growth factor (NGF) may lead to increased mechanical sensitivity in the masseter but not in the temporalis muscle as well as increased entropy, without increasing the occurrence of referred pain or headache days, according to a study published in Cephalalgia. In a randomized double-blind placebo-controlled study, 16 healthy participants (11 men; mean age, 28.1) received 2 injections of NGF or isotonic saline in the left or right masseter and temporalis muscles. Assessments of mechanical pressure sensitivity, pain sensitivity, referred pain, and headache occurrence were conducted at baseline, 3 hours after the first injection, before the second injection (2 days after the first injection), 3 hours after the second injection, and 7, 14, and 21 days after baseline. Cutaneous sensitivity was assessed by asking study participants to evaluate pain levels using a 0 to 100 numeric rating scale produced by the application of a 512-nm Von Frey hair to 15 sites in both muscles. Pain sensitivity was assessed using the same numeric rating scale following applied pressure (0.5, 1, or 2 kg) with 1 of 3 palpometers for 5 seconds to muscle sites. Diversity of score values obtained for mechanical pressure/pain sensitivity across the 15 sites was evaluated for each applicant using entropy measurement. Cutaneous sensitivity was not affected by the NGF vs saline injection. Mechanical pressure was higher at baseline in the masseter vs temporalis muscle (P <.05), and NGF injections resulted in higher mechanical pressure/pain sensitivity in the masseter (but not temporalis) at all time points for the 3 pressures tested (P <.05) except for baseline and the 21-week follow-up. Entropy was found to be higher on the side that received NGF vs saline (P <.001). 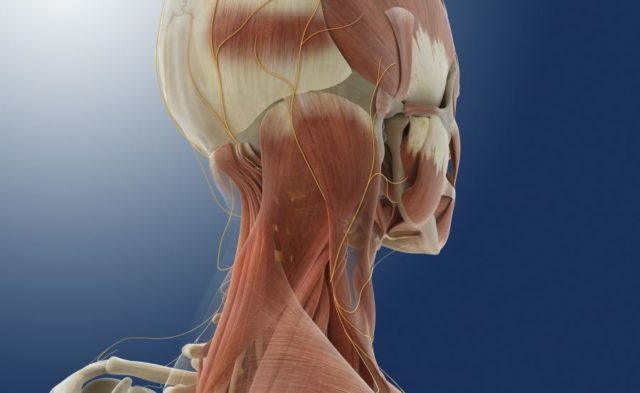 NGF injection did not result in increases in referred pain — which was comparable in the masseter and temporalis — or number of headaches, compared with saline injections. The pain drawing area was larger on the NGF vs saline side (P <.004). Results from this study may not apply to patients with tension-type headache or myalgic temporomandibular disorders. “These findings support the idea that in healthy individuals, referred pain may be an epiphenomenon of the muscle in response to noxious input,” concluded the study authors.